It’s always a treat to step outside the doors of La Fonda and wade into the crowd of Spanish Market artists and visitors. This year was no exception and the market provided a surprise in the form of a new category – Innovation Within Tradition. The new category allows traditional artists to introduce some contemporary themes into their work. The guidelines are stringent – requiring the techniques or processes the artist uses to remain traditional but allows exploration within the content of their work. 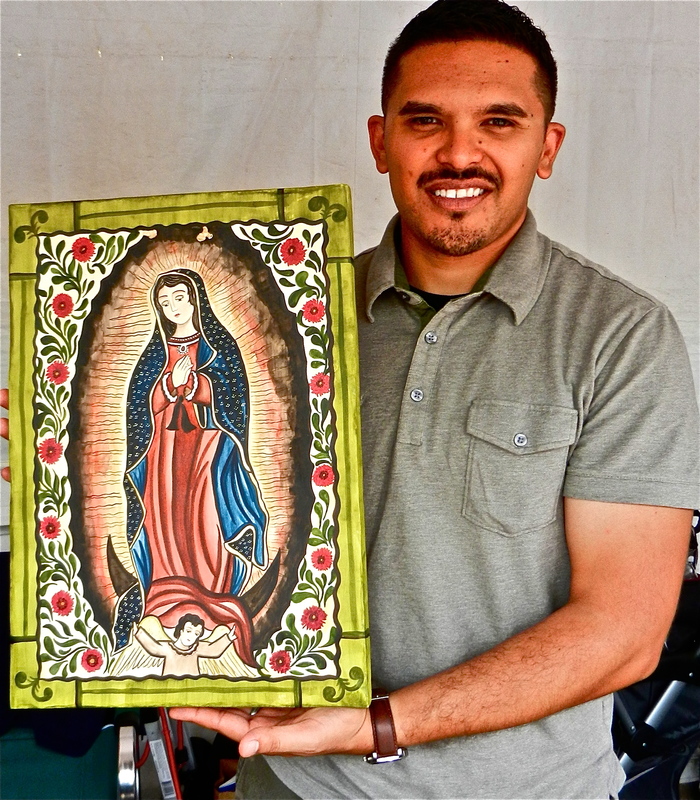 Gustavo Victor Goler, a traditional bultos and retablos artist added some whimsy to his work this year to the delight of visitors and the Spanish Market judges. 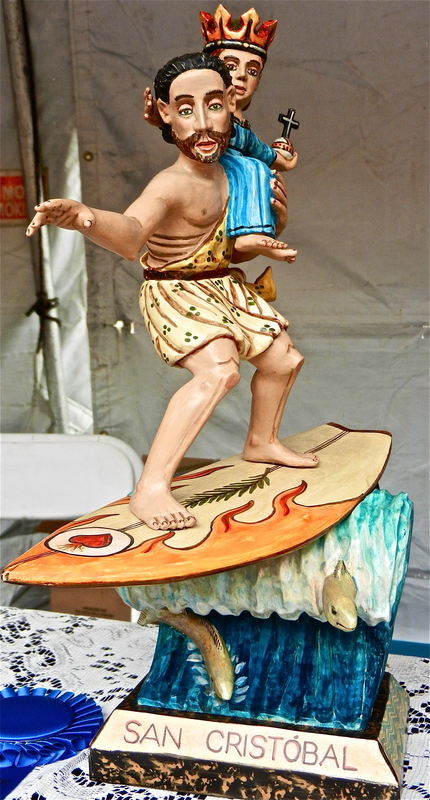 His San Cristóbal won first place in the Innovation within Tradition category depicting San Cristóbal on a surf board. San Cristóbal (Saint Christopher) is commonly known as the patron saint of travelers, but in digging deeper, Goler found that surfers claim him as the patron saint of surfing. Another interesting phenomenon that many artists noticed this year was a change in crowd activity. Over the years, it was not uncommon for crowds to descend on the market at 8am on Saturday and buy up the most popular and/or award-winning artists’ work. Over the last three years, however, the economy has influenced buyer behavior. Collectors are being choosier and taking their time in buying pieces. This has allowed many artists the ability to have inventory for the entire weekend, relax and enjoy talking and selling for the full two-days of the market instead of the frenzied and chaotic couple of hours at the market opening. Lorrie Aguilar-Sjoberg, an encrusted straw artist, lowered her prices this year in response to the slow economy. Lorrie would rather have patrons be able to afford the piece they really want and take it home and enjoy it. 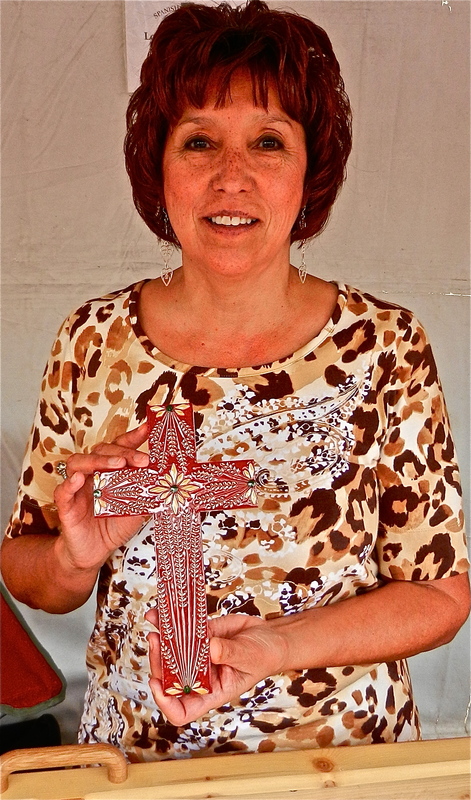 She’s fortunate to have low overhead – buying the wood she uses for her crosses in bulk and growing her own straw. Just down the row from Lorrie, devotional artist Tim Lucero displayed his retablos. Tim showed his work for many years in the Youth Market and was mentored during that time by Lorrie’s father, santero Filimón Aguilar, now retired. The Youth Market is another fun element to Spanish Market and allows the youngest generation a way to not only learn from experienced artists, but also display their work – going through a similar jury process as their Traditional Spanish Market elders. This is Tim’s second year showing as an adult. Last year Tim won third place in the Small Retablo category. This year he won an honorable mention in the that same category. He’s inspired by the work being done by other artists in the Innovations Within Tradition category and looking forward to exploring it more in his work for next year. Spanish Market offers art lovers a chance to explore the evolution of an art form – from youth learning traditions to a new generation of artists expanding the definition of traditional Spanish art to the masters creating exquisite pieces of devotion. We are fortunate to have it all unfold right outside our door every summer. 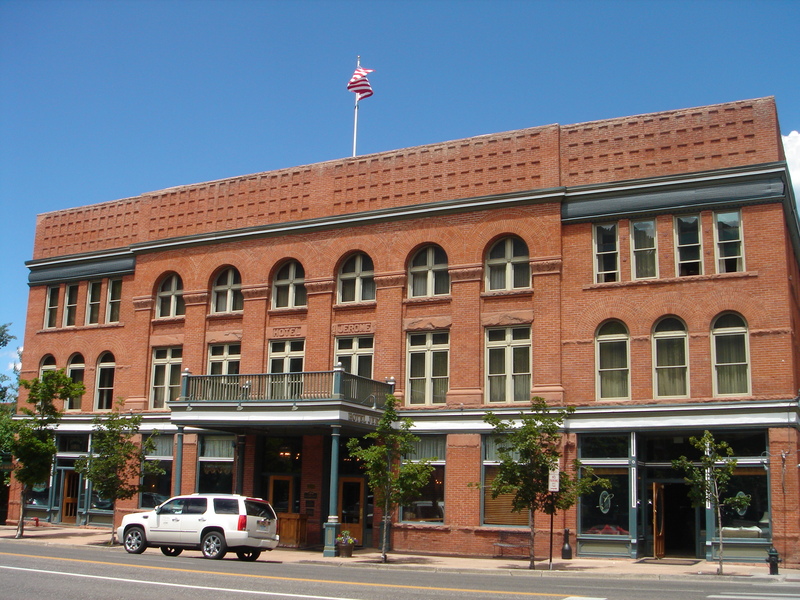 Living in Santa Fe, I have a great appreciation for cities and towns like the City Different – those special places that combine the beauty of nature with a sophisticated art and food scene. This past weekend, my mom and I drove to Aspen, Colorado. It’s about a 5 1/2 hour drive and we made a leisurely stop in Salida, Colorado to eat lunch beside the Arkansas River at the Boathouse Cantina. The river is currently roaring from winter snowmelt. Decent food combined with the sound of the river beside you is magical. 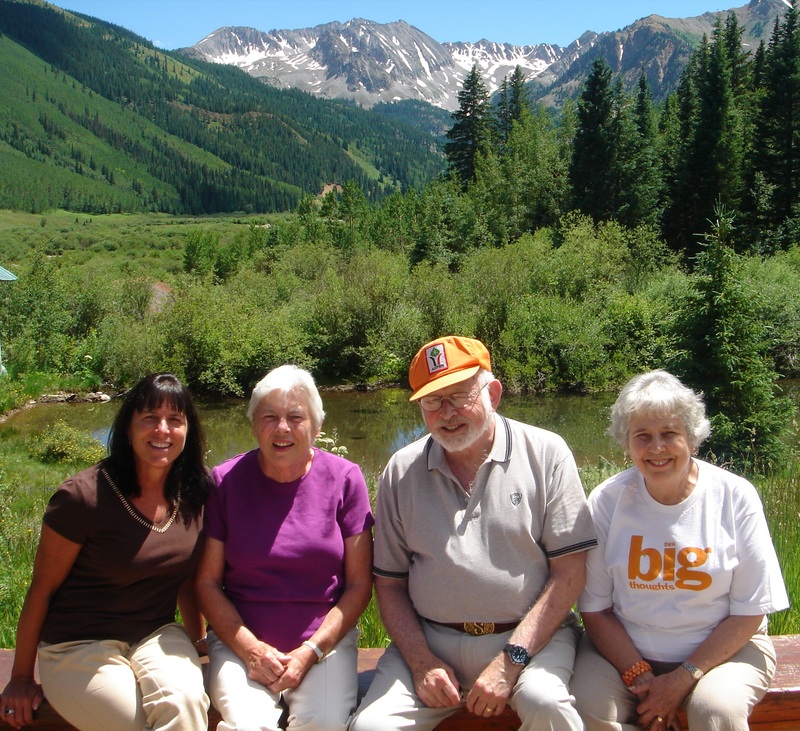 Once in Aspen, we stayed the first two nights with Don and Norma Stone, college friends of my late father. Don served as Vice Chairman of Federated Department Stores and is now on the board of the terrific watch company, Fossil. He has been involved with many nonprofits including serving as Chairman of the Board for both the Cincinnati and Dallas Symphonies. Norma has a doctorate in education so is no shrinking violet. Exploring Aspen with two powerhouses such as the Stones was very entertaining. It reminded me that no matter where you live or where you vacation, it’s the people who can turn a nice place into a charming place, full of character. View from condo the Stones have rented for the past 28 years. 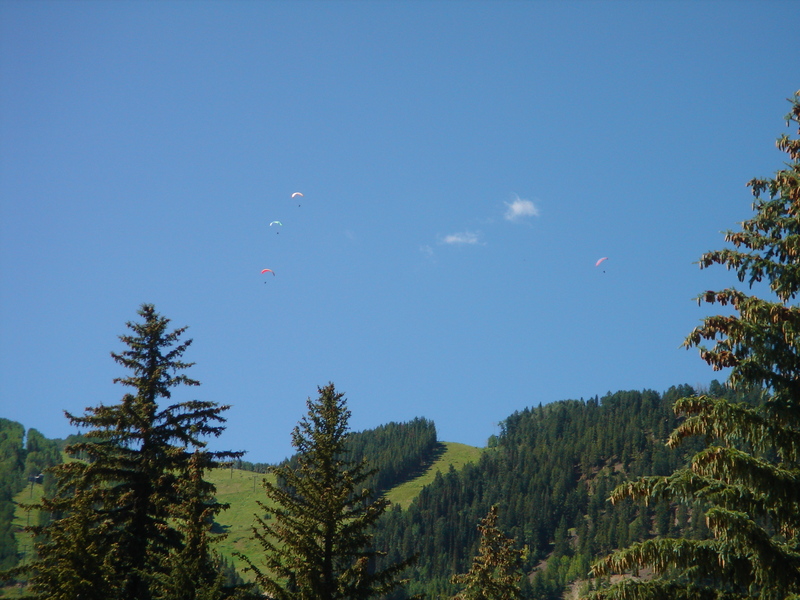 The dots in the sky are parasails. My mother and I started each morning with a walk through the Aspen Institute and the Aspen Music Festival grounds, and then hiked down to the Roaring Fork River which was true to its name this weekend, with whitewater rushing down the mountain. We attended a performance of the Aspen Santa Fe Ballet – a cultural treasure that we in Santa Fe are fortunate to share with our neighbors in Aspen and vice versa. Three dances were performed, all modern, intriguing and fun. Afterwards, an ice cream cone and cookie is a must from the Paradise Bakery in the heart of downtown, which had more people lined up to get inside than a Lady Gaga concert. 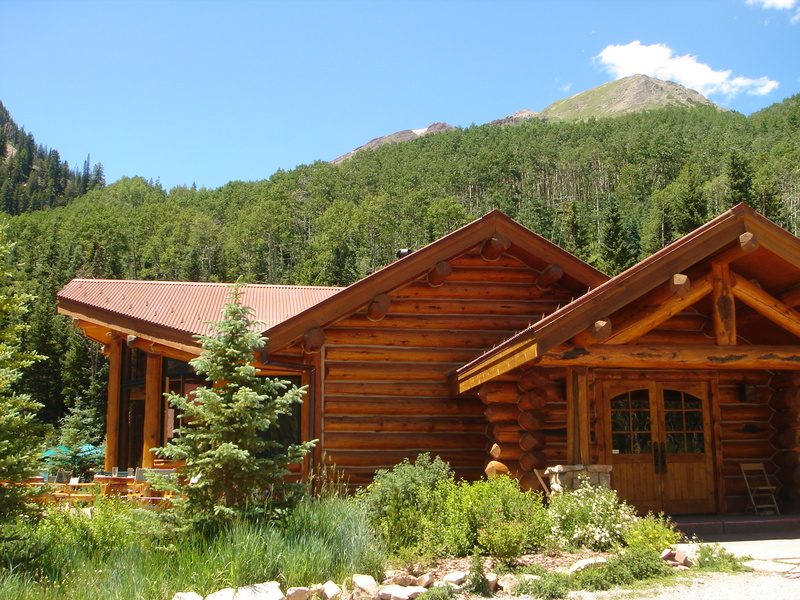 If you’re in Aspen for more than a day, a worthwhile drive is to the Pine Creek Lodge for lunch. Thirty minutes from downtown is a lovely restaurant, seemingly out in the middle of nowhere, but it is grand central station for road bikers in the summer and cross-country skiers in the winter. The road dead ends into the mountains just a bit farther than the lodge, and the road is dotted with hiking trails and fields flush with wildflowers as far as the eye can see. 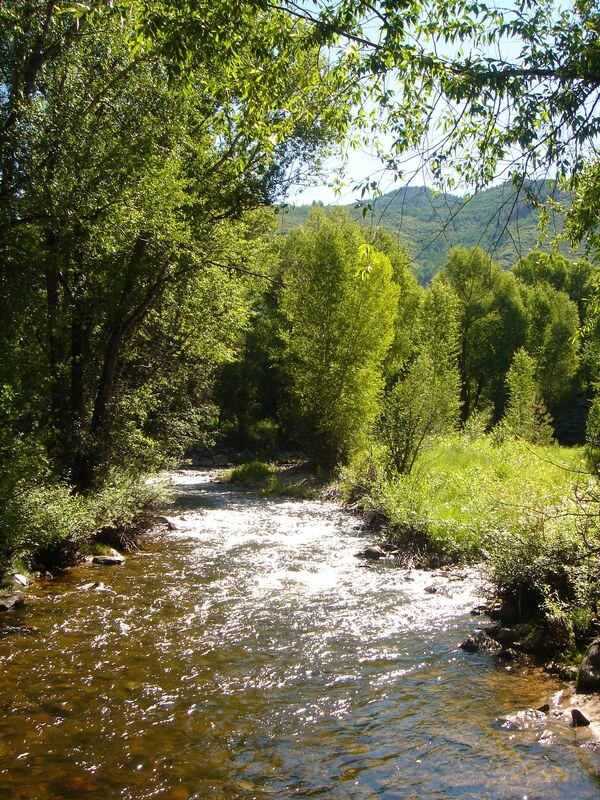 If you’re a runner like me, you’ll want to try the Rio Grande Trail, which follows the Roaring Fork River. I started the run downtown and then ran towards Woody Creek, back via the Cemetery Lane Trail, which loops back into downtown Aspen. 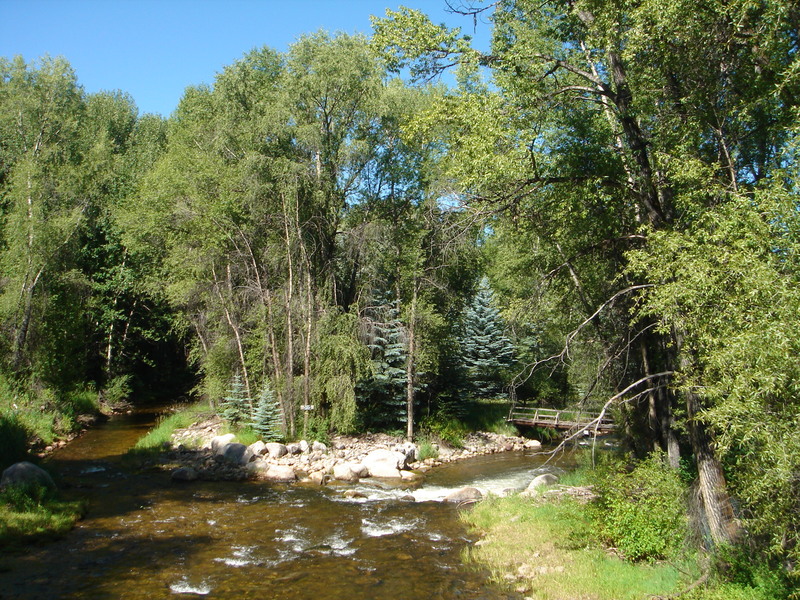 It is around a 7 mile, lovely loop, mostly along the white water of the Roaring Fork. Looking for another enjoyable place for dinner? We spent one evening at Plato’s Restaurant, in the Meadows Resort, which is on the Aspen Institute Grounds. 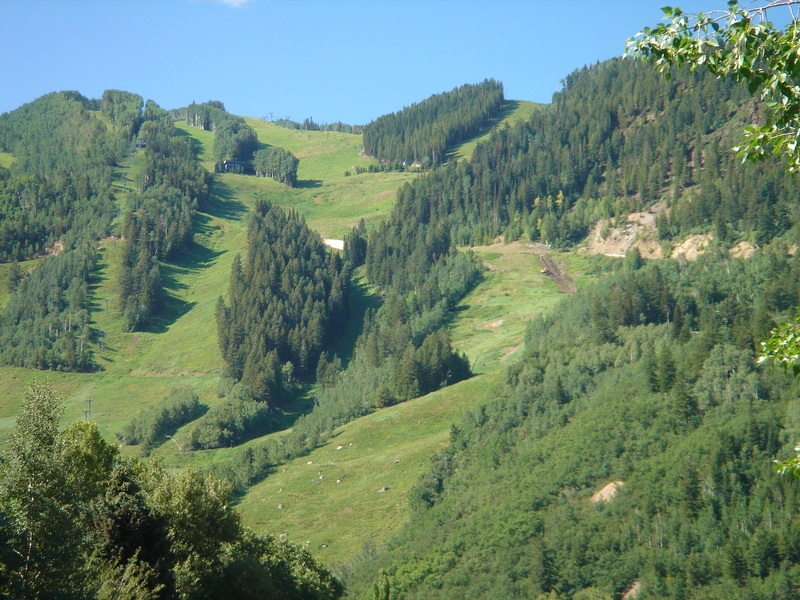 As Plato said himself, and the restaurant enjoys quoting, “The first and greatest of necessities is food, which is the condition of life and existence.” The view from the deck, overlooking Buttermilk ski area, the river below and mountains in each direction, is awesome. And surprisingly, the food stands up to the view. A new, interesting and clever casual restaurant in the heart of downtown is called Junk. It serves salads in Pyrex 4 cup measuring bowls, tacos served flat on a cutting board, and the Asian noodles I ordered were served in a Chinese takeout container. The food was delish and the restaurant design and service was fun, new and very inventive and the prices (for Aspen!) are not bad. And of course, since I’m in the hotel business, we had to check out the historic Hotel Jerome, dubbed the “crown jewel” of Aspen. The service was gracious, warm and friendly. Our room was impeccable, beautifully furnished and like La Fonda, each room is individually decorated. If you enjoy historic hotels (and how could you be a fan of La Fonda and not love historic hotels?) 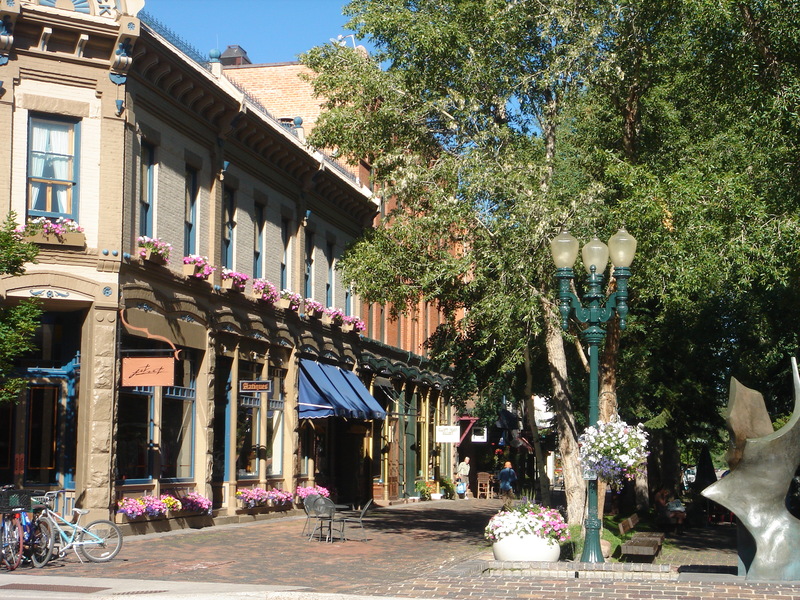 Hotel Jerome is sure to delight you on your next trip to Aspen.